Former Fox & Friends host and current haunted doll Heather Nauert is Donald Trump’s nominee to be America’s next ambassador to the United Nations. Nauert, 48, was named to replace outgoing ambassador Nikki Haley. How unlucky for us! “She’s very talented, very smart, very quick, and I think she’s going to be respected by all,” Donald Trump said on Friday morning. Nauert, who most recently served as the State Department’s spokeswoman, like virtually every other Trump appointee, has no relevant experience for the job, and has a long history of saying racist things. As a talking head on Fox News, she peddled the Benghazi conspiracy, claimed that immigrant children are bringing “disease” into America, railed against “illegals,” and lamented that “sharia law is now changing everything” in the United States after a a YMCA in Minnesota accommodated a group of Somali-American Muslim girls during swimming class. 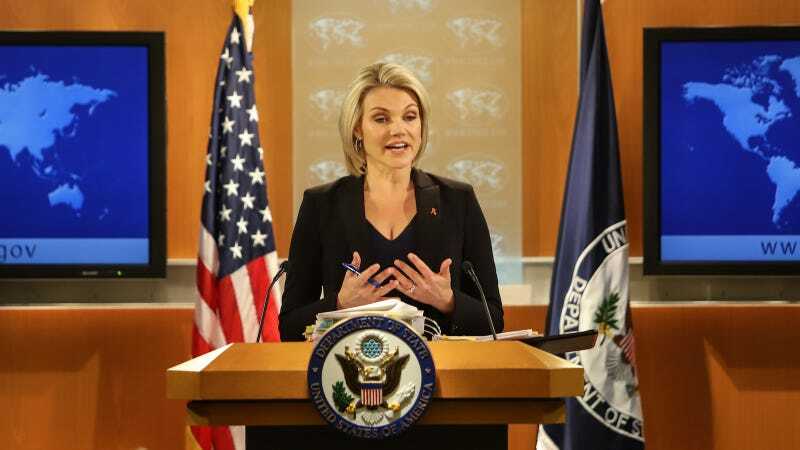 During her tenure at the State Department, Nauert greatly enjoyed touring Saudi Arabia after the Saudi government allegedly murdered and dismembered a dissident writer. Heather Nauert, expert on posting the right Instagram photo at exactly the right time, is the person Trump wants to represent American interests at the United Nations. She now goes to the Senate for a vote. Congratulations to Heather Nauert.